I am knowledgeable in many topics, however science and engineering are not one of them. Jonathan Bopp, my brother is extremely nerdy in these areas…and here’s a peek into his genius! I was very excited to see him this past week at a convention I had no clue existed. 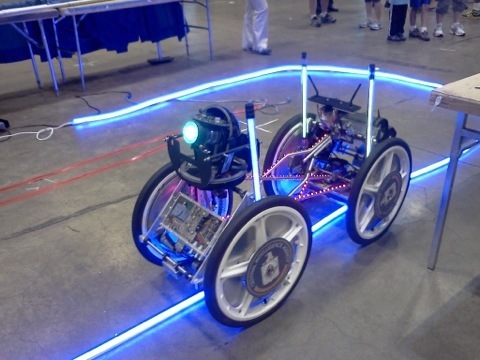 It was the FIRST robotics competition (FRC) where High schoolers from across the world compete with actual robots they constructed to complete a particular task. This year, robots had to play basketball as well as balance on a see-saw type bridge with other robots. Now, I would have no idea how to even start a project like this. My brother does this on a regular basis. On top of the competition, companies were also represented including NASA, Siemens, and the CIA. They are there mainly to scope out future controllers of the world and the next Steve Jobs. My brothers team, Cyborgs from Westminster Academy in St. Louis, MO. were up against 400 teams with years of experience. This was Jonathan’s first year. They made 57th place in their division. That is AMAZING! Look out world for my brother, BOY GENIUS!